Just two games left for this season of IPL, and one is here today, Qualifier 2 between Underdogs Rajasthan taking on Mighty Mumbai Indians. Mumbai missing out against CSK will have a second chance to make it to finals, spirited Royals will look to make to the finals for the second time in their IPL career. Qualifier 2, Dravid won the toss and decided to bat first, as always Dravid & Rahane gave a decent start of 44 runs for the first wicket before Rahane sweeps one between legs of Harbhajan to be castled. Quick two wicket in 8th & 9th over pushed Royals back, Dravid & Binny struck for a brief moment before Dravid was out to a loose shot off Bhajji again. However Yagnik & Hodge again propelled royals to a good score of 165 with some innovative shots. Bhajji was the star for Mumbai as he picked three crucial wickets & two important catches to add. – This is just second time in 16 matches Rajasthan have failed to defend a score of 165+. – 3-23 is the second best figures for this season, falling behind 3-14. – Pollard’s wicket of Kevon cooper is the 50th in his IPL career. – Dravid has hit 69 fours this season which is the most by him in any IPL season; previous best was 67 fours in last season. – Today is the second time Dravid has played beyond 15 overs in 17 innings of this season. – This is 7th time Mumbai have chased a score 165+ out of 21 times they have chased. Game 1, Last game in cricket field for the Australian Wicket keeping legend Gilchrist. Rohit won the toss and decided to field first, Both the openers didn’t make a big impression as they departed with 6 on the board. It was left to Azhar Mahmood & Marsh to take the KXIP into safety, which they both did perfectly with timed aggression with a partnership of 148 runs. Later scoring 80 of 44 balls and Marsh got 63 from 47 balls. Manan Vohra late 20 made sure KXIP scored 183 in 20 overs. Mumbai was totally out of form today, no one looked to get going at any point and credit also goes to KXIP bowlers who kept Mumbai always in the bay. However best part is when Gilly bowled the last over for the first time in his cricketing career and picked wicket in the very first ball. Later followed the Gilly’s own version of Gagnam style to end the veteran’s cricketing career. Game 2, Just time pass for the crowd should we call it, rain curtailed match and 8 overs per side. Tailor made situation for players like Gayle, Kohli & ABD. RCB in a do or die situation came really good with skipper leading from the front scoring a quick fifty. Few skiers from Gayle in the middle overs made sure to get mammoth 106/2 in 8 overs. CSK never got into chase, late strike from Dhoni & Vijay made sure CSK scored 82 runs. RCB won a very important game and now they will be hoping KKR to win the game against SRH tomorrow and make way for RCB to playoff’s. All eyes on tomorrow’s last game of this season, which will decide the last spot of playoff’s. 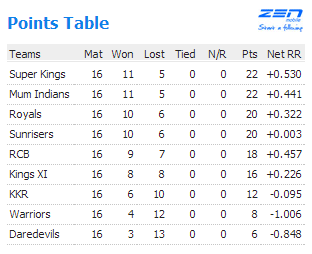 KKR wins – RCB through, if SRH wins they go through. Simple equation, without any doubt the whole Bangalore will be watching the match rather than Kolkata. – Azhar Mahamood became the fourth bowler in T20 cricket to pick 200 wickets, others were Alfonso Thomas – 216, Dirk Nannes – 214 and Malinga – 209. 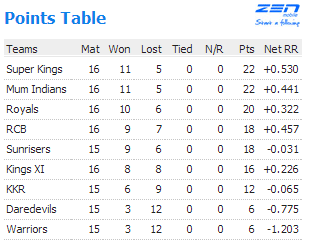 – With 7-5 wins, KXIP is the only team to have more victories than loses against Mumbai Indians. – Gilly ended his career with 2069 runs in IPL in 80 innings. – 148 runs partnership between Mahmood & Marsh is the third highest for the third wicket in IPL. – Mumbai today used 8 bowlers which is 10th time in 784 IPL innings. – Lasith Malinga became the first bowler to pick 100 IPL wickets. – Piyush Chawla getting Rohit Sharma bowled is the 23rd of the type for Chawla, highest by any bowler in IPL. – Adam Gilchirst bowled for the first time in his all formats of cricket and he picked wicket in his very first ball. Harbhajan being the famous victim. – A victory by 50 runs for KXIP against Mumbai is the third time to get victory more than 50 runs. – Kohli’s fifty of 28 balls is the fastest in his IPL career, bettering his previous which came of 31 balls. – Virat Kohli becomes the third batsmen to score more than 600 runs for this season after Hussey & Gayle. – Adithya Tare scored the 600th six of IPL 6. 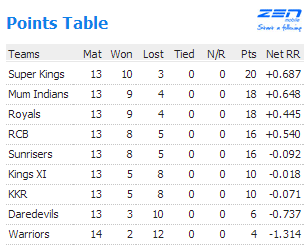 – 22 points scored by Mumbai & Chennai equals the highest secured by Rajasthan in 2008 and by Delhi in 2012. – Zaheer has dismissed Dhoni for the 6th time in 12 IPL innings. – Gayle became the first batsmen for this season to score 700+ runs for this season, also to score 50+ sixes. 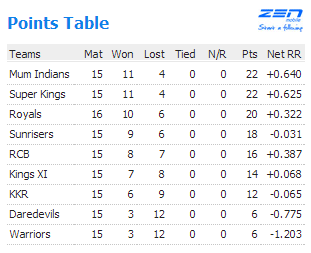 Game 1, Another PWI’s dismal show and this time against mighty Mumbai Indians. PWI scored 112 in 20 overs which is not even a contest for Mumbai even though continued to pick wickets in regular interval. Over & all one thing to mention is Mumbai finally fielded their Million dollar man Glenn Maxwell as Pollard was injured. Misery Mitchell finished the neat job for Mumbai in the first innings to set the tone and Bhajji finished it with a Bhagnam dance to move second spot in points table. Game 2, Sunrisers took on KXIP on a very important game, Being a must win game, Sunriser’s finally came good with bat, thanks to Parthiv patel 61 and late contribution from Perara. 150 exactly on the board, KXIP on a tricky chase lost Mandeep early, however none of KXIP batsmen showed no hurry in chase and went in a very slow pace, which back fired them in the end. Even Pomersbach being not out in crease didn’t help in the course of victory. Sunrisers won the game comfortably in the end. – PWI have lost their 12th game in a row now. – Rajagopal Satish scored the 500th IPL six for this season. – Virat Kohli became the third player to score 500+ runs in IPL 6. – Jaidev Unadkat became the second player to get a 5fer for this season. – J. Unadkat 5/25 is also the best bowling figures in his IPL career. – 4-0-8-2 is the most economical spell bowled by Mitchell Johnson is the best by any bowler for this season. – Virat Kohli became the 11th batsmen to score 99 runs in T20 international among the 11, 9 were remained not out, only Virat & Hales are to be dismissed in 99. – 61 runs scored by Parthiv patel is his career best, bettering his previous best 57. – Out of 13 matches played by SRH, on 10 occasions they failed to reach 100 runs in 10 times. – Pune Warriors have fielded 25 players till today highest by any team in IPL. – Dwayne smith became the third victim to be out in the very first ball of innings. – Pune Warriors have not even scored a boundary in the last 9 overs, and its second time they have done it. – Mandeep became the first player to be out on a pair for this season. As expected Chennai became the first team to qualify for the play offs. Sun risers won the toss and decided to field first. But Sanga’s decision to bowl first was good for just first 6 balls. Murali Vijay then took Ishant for hat trick of sixes. Later he departed, Hussey & raina displayed a subliminal form of batting. A pleasure it was when Raina was striking it exactly in the covers of off side where field will not be able to get too. Raina finished the innings with a boundary and left stranded in 99*. CSK scoring a mammoth 223/4 in 20 overs.. Sunrisers never looked like chasing at any point of time, Dhawan was the man who could have pulled out some miracles but spot on Dhoni removed him cheaply, later it was a procession and CSK sealed the deal as the time passed. – This is the first game won by a team batting first in Hyderabad for this season. 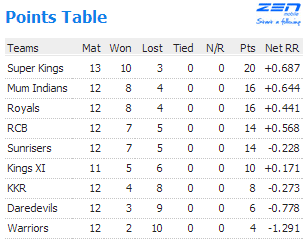 – Sunrisers lost their first game in home for this season; they have now won 5 games out 6 played in Hyderabad. – Dale Steyn Bowled the 30th Maiden of this season. – Mike Hussey has played out 3 Maidens including the one he played in the first over. – 50 runs scored in first six overs by CSK is the highest for any team in Hyderabad, previous best was 41 by Home team. – 91/1 in ten overs is also the highest for this venue bettering Sun risers 61 runs. – Mike Hussey now has 5 fifties for this season, highest by any player. – Amit Mishra bowled the first No-ball of his career in IPL, he has bowled 1554 balls before delivering a no ball today. – 66 runs conceded by Ishant Sharma is the highest ever by any bowler in IPL history, beating 63 runs conceded by Aaron & Dinda. – Hussey & Raina now has 1018 runs partnership between them, this is the fourth pair to do it. – Hussey now has two 1000 runs pair, one with opener Vijay and followed by Raina. – 223 runs scored by Chennai is the second highest for this season by any team. It is also the highest scored in this venue bettering 217 scored by Royals. – Chennai become the only team to hit 2 200+ scores for this season. 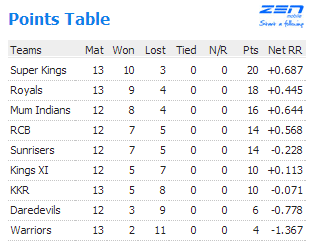 – 77 runs victory by CSK is the 5th away win for them, which equals CSK’s their record of winning 5 games away.